Road To Miss Nepal 2018 has Officially Started ! The hunt for the 23rd Miss Nepal 2018 has started, 20 contestants of Nepalese origin from all over the world will compete in 4 weeks training sessions. 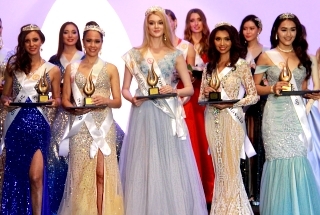 In the final night, Top 4 winners will be crowned who will represent Nepal in Miss World 2018, Miss Universe 2018, Miss Earth 2018, Miss International 2018 respectively. Here are the official Top 25 contestants that have been chosen from the regional auditions. Last edited by NepaliAmir on Sun Apr 01, 2018 9:16 am, edited 4 times in total. Re: Road Towards Miss Nepal 2018 Has Begun! One of the taller regional winners till date. Rosie standing next to 5'11" height Nagma is clearly not far off at 5'9". Weak Winner - Miss Pokhara 2017 is Mamta Joshi will represent Pokhara in Miss Nepal 2018. 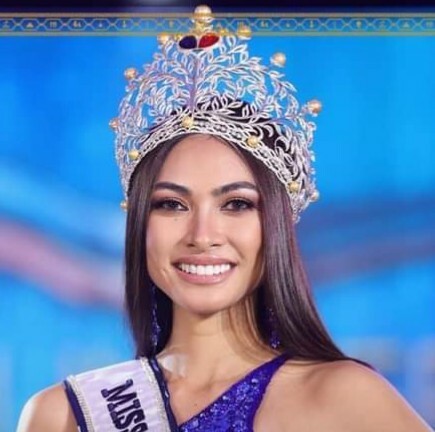 Either that or they will held a new contest called Miss Universe Nepal just like what Femina did with Miss Diva since you know Julia will not be happy if she hears that Nepal is sending Miss Nepal winners to Miss Universe. Btw Miss Universe is getting more popularity in Nepal compare to Miss World now, it's not just because of Nagma but Miss Universe has always been popular it's just wasn't supported much by fans since we had nobody to root. Even the hidden treasure were saying how big and important Miss Universe pageant is and it felt like they are now finally taking more focus on Miss Universe than Miss World. Nikita is faded away and since Nagma is a household name, expect Miss Universe Nepal to get more contestants in next year pageant. But now I think they will either crown Miss Nepal as Miss Nepal Universe and World, Earth, International and Asia Pacific will be her runner ups or they will make a separate contest which I think is a better idea as it won't cause conflict with Miss World. I would be surprised. Nepal has been doing very well in MW. And Shrishti is much more famous than Nagma....and in any case her success doesn't naturally ensure a fan base for Miss Universe. They could hold a separate contest like India but just like in India it would be a waste of money, especially for a much smaller country. Jon A wrote: I would be surprised. Nepal has been doing very well in MW. And Shrishti is much more famous than Nagma....and in any case her success doesn't naturally ensure a fan base for Miss Universe. They could hold a separate contest like India but just like in India it would be a waste of money, especially for a much smaller country. Lol you have no idea how much popular Nagma is in Nepal, Shristi is more popular among international fans than Nagma for sure. But in Nepal, Nagma is a household name as she was started doing her TV hosting since she was only 18 years old in 2009 and now she is 25. Most people in Nepal have seen her in TV before Shristi and Nagma is always in Nepali TV Shows, specially with Image Channel (2nd most watched Nepali channel in Nepal). 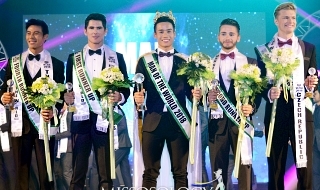 So, I won't be surprised next they will change winner to Miss Universe Nepal and World as runner up lol. Or do a separate pageant which I think is the best thing since so many girls in Nepal want to compete in Miss Universe as they think it's more glamorous than World. And we will have taller and smart girls compete in this pageant as so many tall girls still are so ashamed to compete in pageants as they think they are too tall. Nagma is a great role model for these girls as she is 6 feet tall and can clearly relate to them. 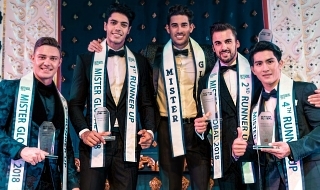 Like Jon A said I too will be surprised if they switch Miss World to second because Miss World may not be popular as Miss Universe but when Nagma come back empty handed from her two week vacation to Las Vegas and Nikita comes back from her three country tour with money they will not make such a mistake. And remember what is popular among pageant fans is not necessary popular among the population take a look at Indonesia all their fans online flock to Miss Universe but Miss World is more popular in the main stream. Obaa Lizzie wrote: Like Jon A said I too will be surprised if they switch Miss World to second because Miss World may not be popular as Miss Universe but when Nagma come back empty handed from her two week vacation to Las Vegas and Nikita comes back from her three country tour with money they will not make such a mistake. And remember what is popular among pageant fans is not necessary popular among the population take a look at Indonesia all their fans online flock to Miss Universe but Miss World is more popular in the main stream. Well, YOU are definitely popular among posters here on Misso, cybercriminal Chellomellow The Cow. Re: Road Towards Miss Nepal 2018 Officially Started ! They should crown as Miss Universe Nepal with this roster of candidates, not just appointing someone, although Nagma was a great debutant for Nepal last year in Miss Universe. Make Miss World Nepal and Miss Universe Nepal having equal importance. this is probably the tallest batch of girls in Miss Nepal history. missofan705 wrote: They should crown as Miss Universe Nepal with this roster of candidates, not just appointing someone, although Nagma was a great debutant for Nepal last year in Miss Universe. They won't make MW and Miss Universe equal as Miss Nepal had Miss World franchise first and they are very pro Miss World. This year they are crowning Miss Universe Nepal alongside Miss World Nepal but according to what they said in Press Conference. They will crown from 4th Place to Winner in this order. One of the best Nepali beauty queens whom I admire the most was Niti (Miss Nepal Intl 2017). Can she still represent your country and this time in Miss Universe? Talent Round was held last week and it seems Shikshya will most likely win Miss Talent title as she had an emotional performance by doing an act on Sexual Harassment and Depression. She is a victim of depression and wants to let this taboo subject out in the public and her BWAP project is about depression and youth suicide. Will she be our Miss World Nepal 2018? stigmata wrote: One of the best Nepali beauty queens whom I admire the most was Niti (Miss Nepal Intl 2017). She is a definition of Nepali beauty but this year I think they will crown one of the 25 contestants of this year batch. Niti is quite young still young as she is only 21. So, maybe when she matures then MN can send her. There have been rumours that Ishani Miss World Nepal 2013 - Miss World 2013 Top 10 and BWAP winner will go to Miss Universe 2018 but it's not confirmed yet. Susmita , #9 and Priya are the frontrunners! Mahima seems to be the tallest girl .... and i think she's will won the Miss Earth Nepal! Wrong, 25 Shrinkhala, 9 Shikshya and 8 Priya are frontrunners and fan favourites alongside 20 Megha. 7 Susmita is not well spoken and 1 Mahima is not tallest, she is actually one of the shortest at 5'6"
But Miss Nepal is not about tallest girl as most winners are always around 5'7" and never the tallest girl. Usually Miss Earth Nepal is the tallest in Top 5/7 so Priya who is tallest at 5'9.5" could be Miss Earth Nepal 2018. Here are summary of shortest to tallest in this year batch and shockingly average height is 5'7" which is taller than usual 5'5"-5'6". Im Glad that Priya is actually one of the tallest girl in the competition cuz shes my Miss Earth Nepal! miss nepal organization is turning out to be one of the best national pageants.. I started wtaching them last year and I was amazed that they had almost all the big titles , world , earth, international and added asia pacific.. now they added universe!! and their crowns are the best looking crowns in the world, not too pageant patty looking and very regal. and they have 5 ofthem! the selection of titles is also great.. they only have the best pageants, universe world international and earth.. Asia pcific may not be on their league but it makes sense that they have it since Nepal is part of the original miss asia pacific pageant. are they going to choose the miss universe representative from the candidates this year?